Lightweight UV-protected mesh safety netting comes to your rescue when you're in need of instant skirting around gardens, seeded lawns, newly laid concrete sidewalks, or freshly painted low surfaces. Easy to install with T-Posts or stakes made from wood or bamboo set four feet apart for heightened stability. This will prevent sagging or collapsing caused from wind stress, animal gnawing, or snow buildup (doubling up on the thickness of netting is recommended for those who live in rural areas prone to frigid weather conditions). Once it's set up, you will have a vibrant visual barrier with maximum visibility that is just as easy to remove, roll up, and stow away in the garage or garden shed for future use. Our mesh visual barrier netting helps prevent small pets from wandering off or accessing areas of your lawn or garden that are off limits. Great for establishing a secondary fence for landscaping purposes, protecting flowerbeds and gardens from being trampled on. Or, put it up to keep toddlers away from your pool and other unsavory areas of your yard. Its multifunctional enough for crowd control use at sporting events, concerts, festivals, carnivals, and other social gatherings where distinct visual barriers are necessary. An economic alternative for those who lack the time or funds for building a traditional fence. Suitable for many other uses and projects, such as securing strawberries and raised beds in your garden, acting as a baseboard around tents while camping, establishing a walking path or a warning perimeter during minor sidewalk construction projects where open trenches are exposed. 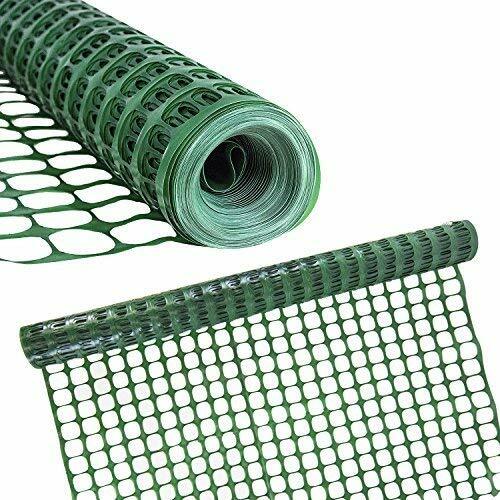 LIGHTWEIGHT MESH SAFETY NETTING: Comes to your rescue when you're in need of instant skirting around gardens, seeded lawns, newly laid concrete sidewalks, or freshly painted surfaces that are easily reachable. EASY TO INSTALL/REMOVE: Best used with metal T-Posts or wooden stakes positioned four-feet apart to prevent sagging and collapsing caused from wind stress, animal gnawing, and pressure from snow build up. Just as simple to remove, roll up, and stow away for future use. 100 FEET IN LENGTH: An economic alternative for those who lack the time or funds for building a traditional fence. Multifunctional enough for crowd control use at sporting events, concerts, festivals, carnivals, and other social gatherings where distinct visual barriers are necessary. REIN OVER YOUR DOMAIN: Control what goes in and out of your garden or property. Keep your animals in and those pesky pests out! Be careful of the sharp edge, avoid getting cut while open and use. 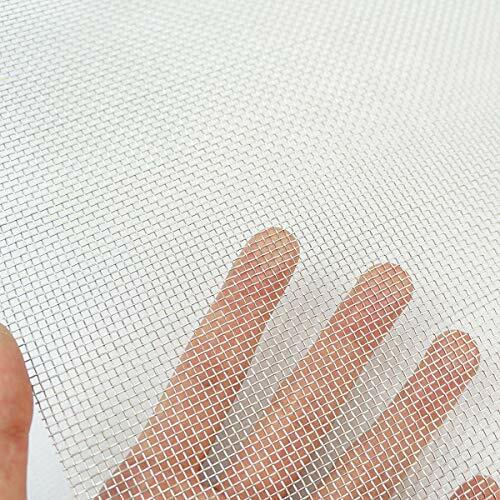 [Wide Usage] Metal mesh sheet can be used for security mesh, construction and building meshes, fan guard mesh, fireplace screen mesh, foundation vent meshes, garden use mesh, gutter guard mesh, cabinets mesh, door screen mesh etc. - Applied to air conditioning, purifier, range hood, air filter, dehumidifier and dust collector. - Suitable for petroleum, chemical, mineral, food, pharmaceutical, painting and other industries filtering. - Used to a variety of filtration, dust removal and separation requirements. Easy to Use - Filter things in daily life, such as septa, sieve powder, etc. Mainly used for air conditioning, purifier, range hood, air filter, dehumidifier and dust collector, Suitable for a variety of filtration, dust removal and separation requirements. This listing is for a 30cm x 60cm(12"X24") cut of 10 Mesh. Multiple quantity purchases will result in multiple 30cm x 60cm sheets. For larger / custom cuts, see below. 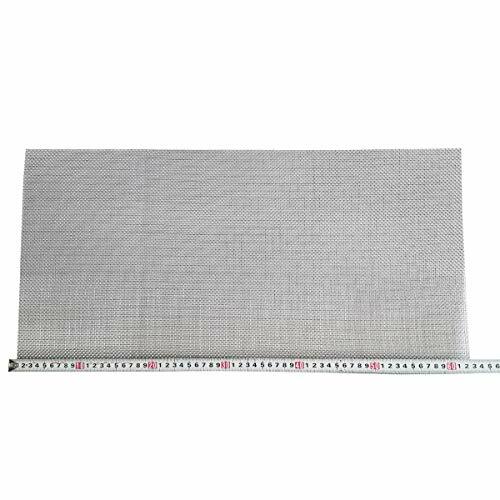 Specifications and Dimensions All wire mesh is made from 304L (Low carbon 304) Stainless Steel, except the 400 mesh, which is made from 316 Stainless Steel. Mesh count is the number of wires per inch, all our stock is square mesh with the same mesh count in both directions. Nominal Aperture is the average hole size. This listing is for a 30cm x 60cm(12"X24") cut of 8 Mesh. 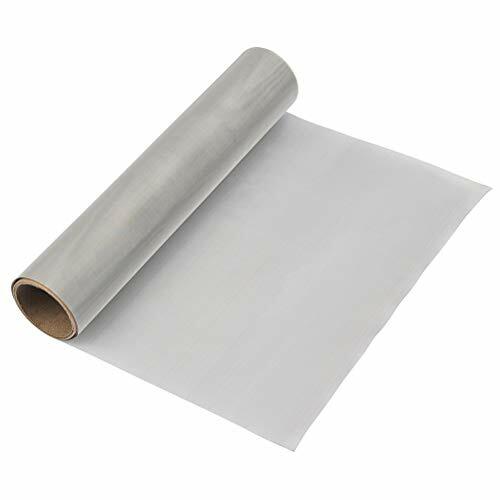 Multiple quantity purchases will result in multiple 30cm x 60cm sheets. For larger / custom cuts, see below. 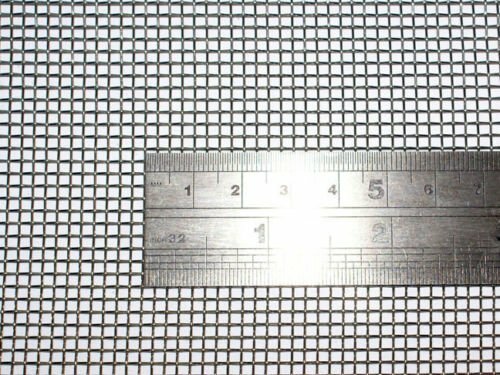 Specifications and Dimensions All wire mesh is made from 304L (Low carbon 304) Stainless Steel, except the 400 mesh, which is made from 316 Stainless Steel. Mesh count is the number of wires per inch, all our stock is square mesh with the same mesh count in both directions. Nominal Aperture is the average hole size. Used it for crawl space vent repair. Great for floors of bird feeders. Easy to trim and fit into area to keep mice from entering The vents easily let mice in. This should prevent any more of the little buggers entering that way, yet still let the vents do their job. This listing is for a 60cm x 100cm(24"X40") cut of 20 Mesh. Multiple quantity purchases will result in multiple 60cm x 100cm sheets. For larger / custom cuts, see below. Specifications and Dimensions All wire mesh is made from 304L (Low carbon 304) Stainless Steel, except the 400 mesh, which is made from 316 Stainless Steel. Mesh count is the number of wires per inch, all our stock is square mesh with the same mesh count in both directions. Nominal Aperture is the average hole size. This listing is for a 30cm x 60cm(12"X24") cut of # 5 Mesh. Multiple quantity purchases will result in multiple 30cm x 60cm sheets. For larger / custom cuts, see below. Specifications and Dimensions All wire mesh is made from 304L (Low carbon 304) Stainless Steel, except the 400 mesh, which is made from 316 Stainless Steel. Mesh count is the number of wires per inch, all our stock is square mesh with the same mesh count in both directions. Nominal Aperture is the average hole size. 1. Cut the Copper Mesh to the desired length with scissors. 2. Stuff, push or pack it tightly into any small crack, hole, gap or opening. Make sure it is tightly compacted so it cannot be pulled out or worked loose. Copper is durable,standing up to the elements and normal wear and tear better than other materials. 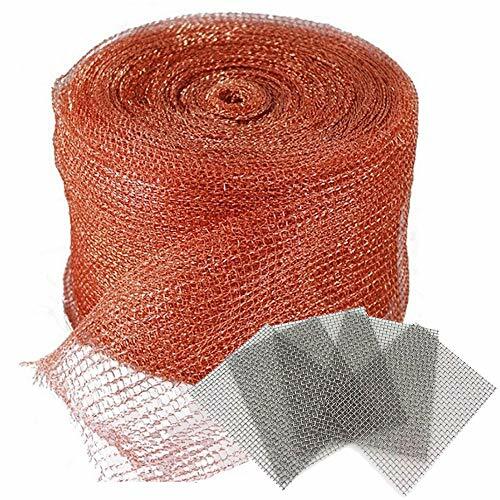 2.Copper mesh is 5 inches wide,30 foot roll,made of 100% copper. 3.Stainless Steel Wire Mesh is 8cm long,6cm wide,totally 5pcs.made of 304 stainless steel. 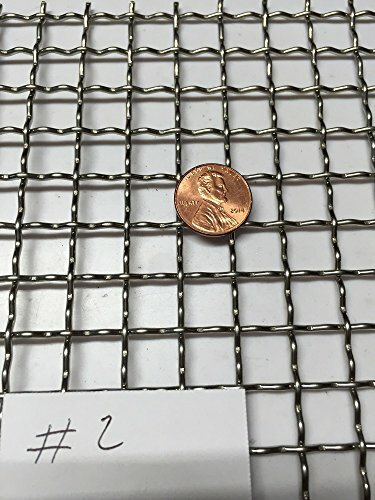 4.Copper mesh is easy to cut, and install. environmental friendly. 1 lb. Of Pure copper mesh to use for packing a distilling Column. Mesh is 5 in. Wide and 20 ft. In Length. 1lb. 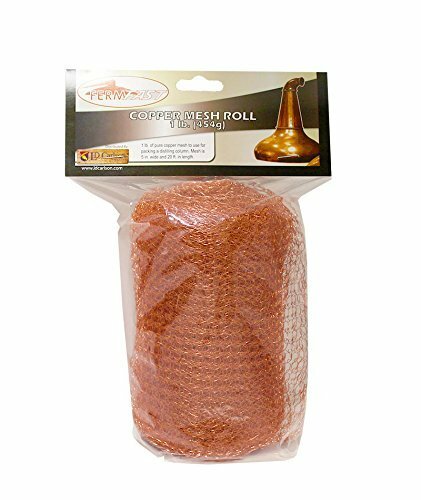 Of FERMFAST copper mesh will Pack a 2 inch Column twice and a 3 inch Column once., copper mesh roll, mesh is 5 in. Wide and 20 ft. Long, for use packing a distilling Column, country of origin - United States, manufacturer name - FERMFAST. The yardgard 1 in. X 2'. x 50'. 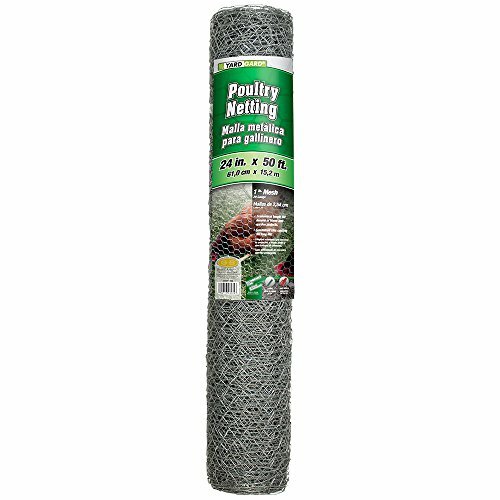 20 Gauge poultry netting is a favorite of farmers, pet owners, & gardners & is recognized by its hexagon mesh weave. This netting is made of zinc-coated steel for durability. Before weaving it has been galvanized for long-lasting rust protection. This netting is used in cages to confine poultry, rabbits & other small animals. You can also use it for soil erosion prevention, plant protection or compost pile confinement. 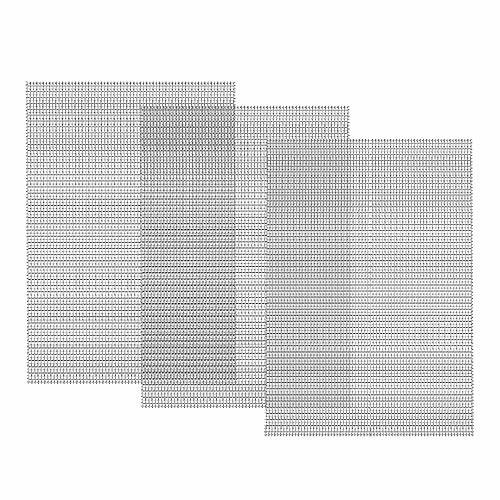 Muzata Stainless Steel Woven Wire Mesh Metal Security Screen Cabinets Mesh Sheet 12 Holes- 12x12"
1. If you install it in the garden for isolation, it can stop several animals entering the garden. 1. Very resistant to high temperatures which can reach 800 degrees. 4. Long service life, up to 15-50 years. Out size:2.52mm/0.1inch, inner size: 1.6mm/0.063in. 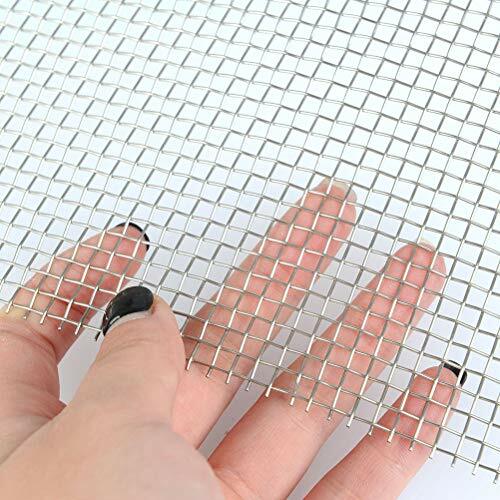 Mesh can be cut into different shape and size, please be careful because the edges might be sharp. 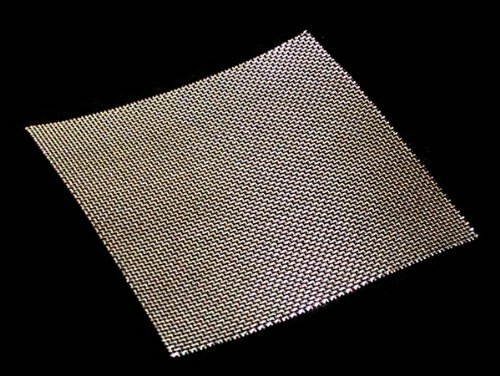 Woven wire mesh sheet is made of strong Stainless Steel, using electrostatic spraying treatment is high anti-rust, anti-damage, anti-invasive through the inspection; Anti-invasive ability of 2.148 tons, stronger resistance to damage. 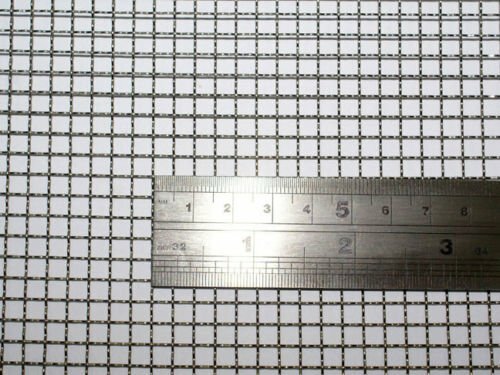 Size: 12x12inch/30x30cm each piece with 12 holes per linear inch; Out size:2.52mm/0.1inch, inner size: 1.6mm/0.063in. Perfect light transmission: the clarity is very high from the inside to outside, and the blurring is unclear from the outside to inside. It can create a safe and comfortable private space for you, and also block mosquitoes from entering the room. Very easy to clean by using rug, providing long service life, up to 15-50 years. 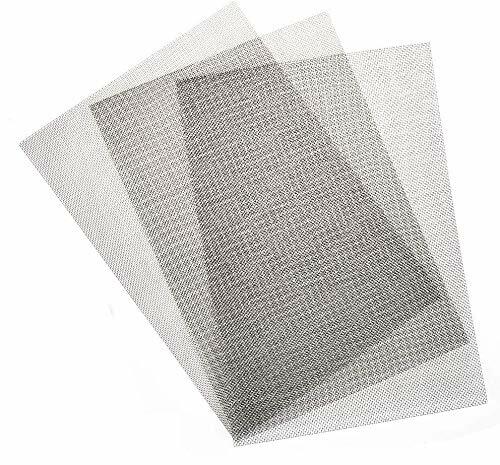 Stainless Steel 316 Filtration Woven Wire Screen is widely used in filtering industrial paint, oil,water. 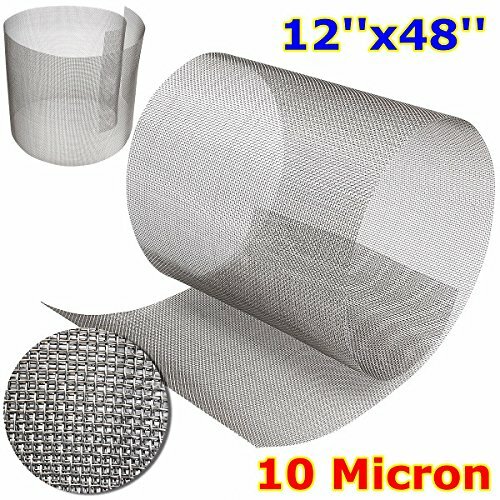 1.304 Stainless steel 50 mesh filtration 16"x 35" woven wire. 3.Water resistant, high temperature, weather resistance. 4.Widely used in In filtering industrial paint, oil,water.  This listing is for a 60cm x 100cm(24"X40") cut of 10 Mesh. Multiple quantity purchases will result in multiple 60cm x 100cm sheets. For larger / custom cuts, see below. Specifications and Dimensions All wire mesh is made from 304L (Low carbon 304) Stainless Steel, except the 400 mesh, which is made from 316 Stainless Steel. Mesh count is the number of wires per inch, all our stock is square mesh with the same mesh count in both directions. Nominal Aperture is the average hole size. 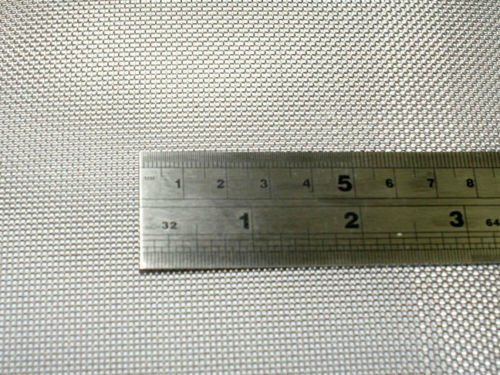 ASC Stainless Steel Mesh 304,#2 .063 Wire,Cloth,Screen,Woven wire 12"X12"
This listing is for a cut piece of (304) stainless steel woven wire. 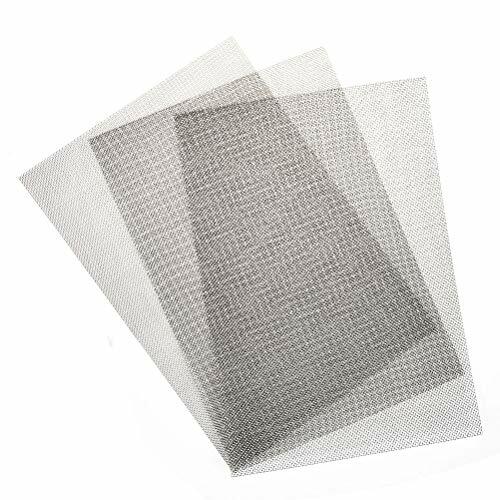 Stainless Steel Mesh 304,#2 .063 Wire,Cloth,Screen,Woven wire 12"X12"
Nylon (Nitex) screen cloth - 6/6: Exceptionally strong and suited for countless sifting, straining, and filtration applications. Provided in the small sizes so useful in laboratory or shop. Can be gamma, steam and Eto sterilized. Slight yellowing may occur during steam sterilization, but will not significantly affect physical properties.